Jamey Hood, principal at Garrett Junior High School, has been recognized as Nevada’s Middle School Principal of the Year by the National Association of Secondary School Principals. 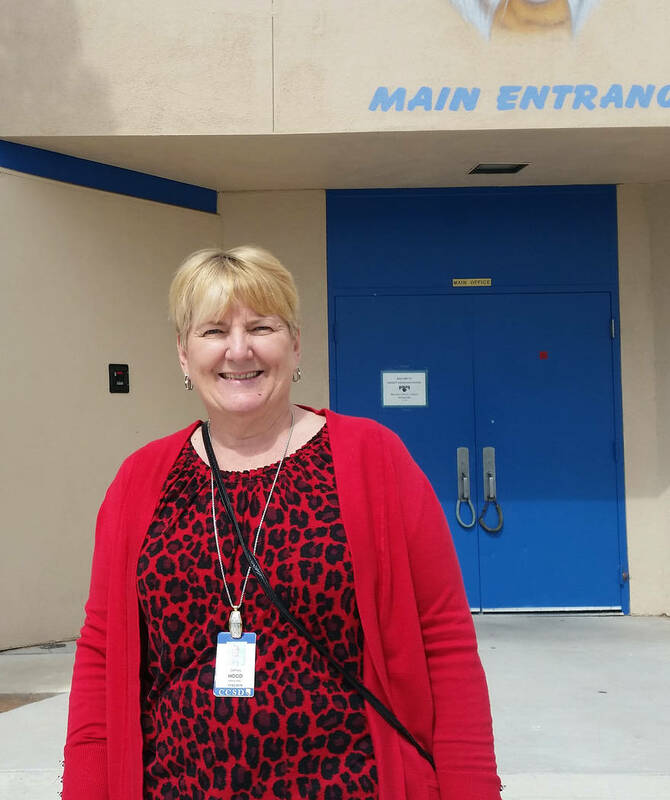 Celia Shortt Goodyear/Boulder City Review Jamey Hood, principal at Garrett Junior High School, was named Nevada's Middle School Principal of the Year for the National Association of Secondary School Principals. She will represent all secondary schools in Nevada in a national competition. She will represent all the secondary schools in the state at the association’s national conference July 11-13 in Chicago as well as for National Principal of the Year honors, which will be announced in October. NASSP is an organization of principals and other school leaders across the United States. Its mission is to transform education through school leadership, recognizing that the fulfillment of each student’s potential relies on great leaders committed to the success of the student. Each year it recognizes the top principals throughout the country. Hood has been principal at Garrett for 14 years. Before taking that role, she taught math and served as an administrator in the dean’s office and assistant principal. This award is her first as a school administrator and she said it honors the work of everyone at the school. “What’s cool about this is you can’t be principal of the year without a great school community. … The most important part of the job is relationships and maintaining good ones with parents, teachers, students and everyone,” she said. In January, Garrett was recognized by the state as a five-star school, meaning it exceeds expectations for all its students as well as demonstrating superior academic performance and growth with no opportunity gaps. It is one of 10 five-star schools in Clark County School District. Hood said she firmly believes that her success, and the school’s success, is about what everyone else at the school is doing. “I hire well and get them what they need and get out of their way and let them do their job,” she said. Originally from Minnesota, Hood was a strong math and science student in high school and was recruited to study computer programming in college. In her second year of that program, she said that she realized she didn’t want to do it and decided to be a teacher. Her grandmother had been one, and she said that she had always wanted to work in that field. She taught math in Minnesota for about 13 years before coming to Nevada.